Here’s a question: can you mail pickles? How about kimchi? I suppose there is only one way to find out… My childhood friend, Marc Strommer, who lives in Los Angeles, suggested we start a pickle /kimchi exchange and I am intrigued by the idea. 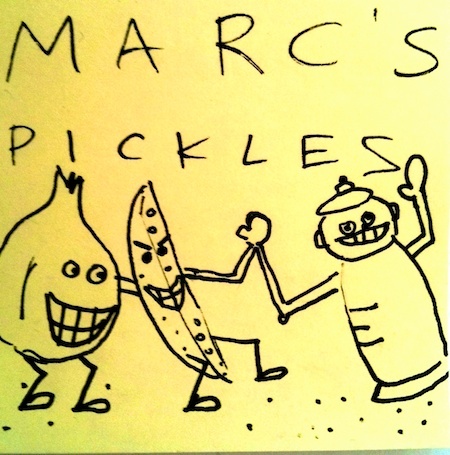 Marc is a professional musician who started experimenting with pickle-making when he couldn’t find pickle chips with enough kick. When we got back in touch a couple of years ago, we bonded over our shared love of pickling and fermenting. I made kimchi (posting about that soon). 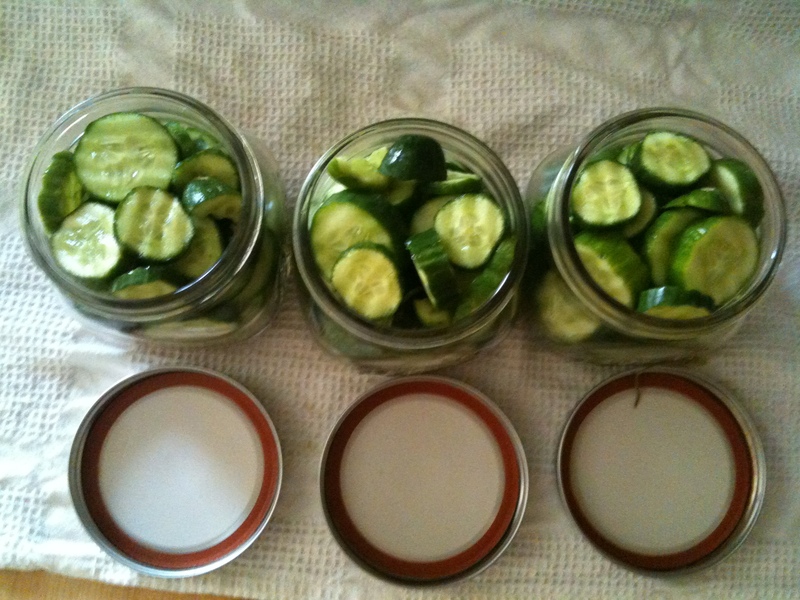 He made pickles. Why not exchange them? Getting them from L.A to NYC seems complicated, though, so he agreed to share his secret recipe with Domaphile while we work out the details. 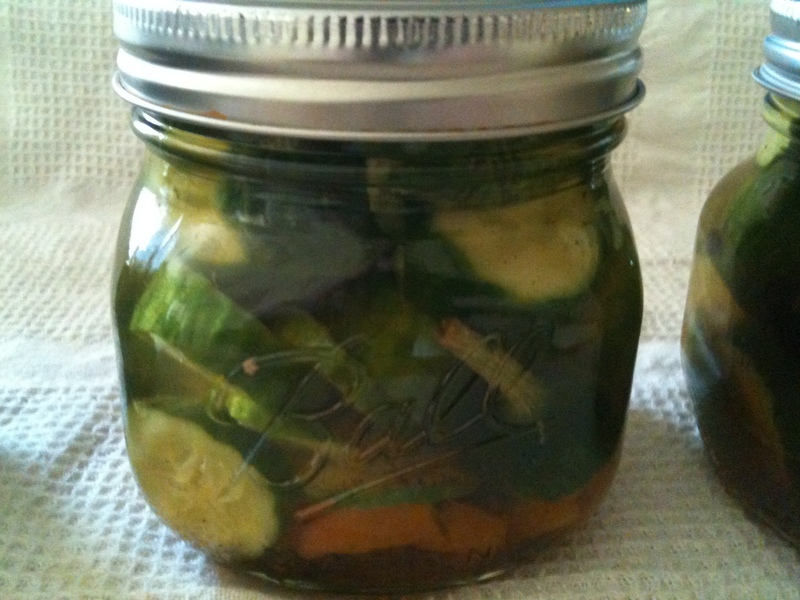 With an over-abundance of jalapeño and habañero peppers from his garden, Marc needed some way to use and preserve them. Inspired by an article about refrigerator pickles and by the Pickle Guys, he started with a 50/50 water to vinegar ratio and then experimented with the ingredients. Regular garlic pepper spears were first, followed by hot pickle chips. The secret was adding a bit of sugar to the batch. 3 habañero peppers sliced seeds and all. Scary, I know. 1. 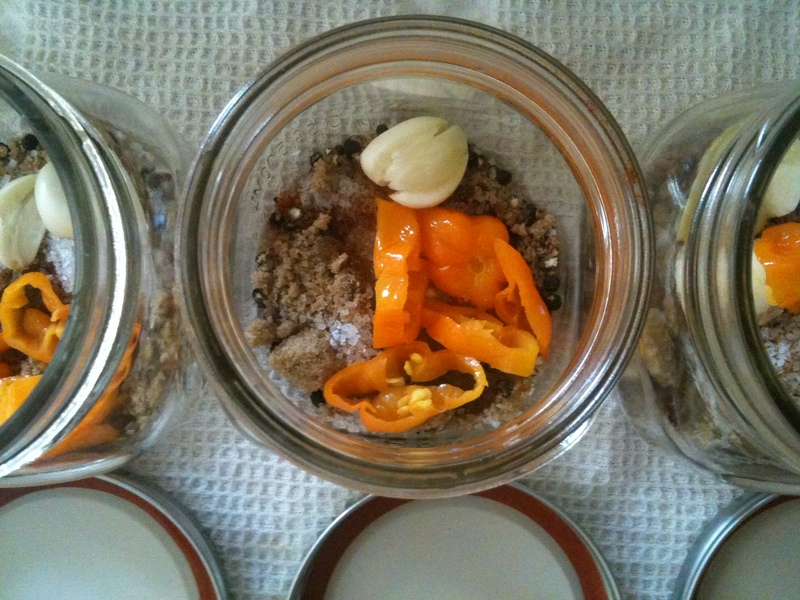 Divide dry ingredients and sliced peppers into three clean jars. 2. 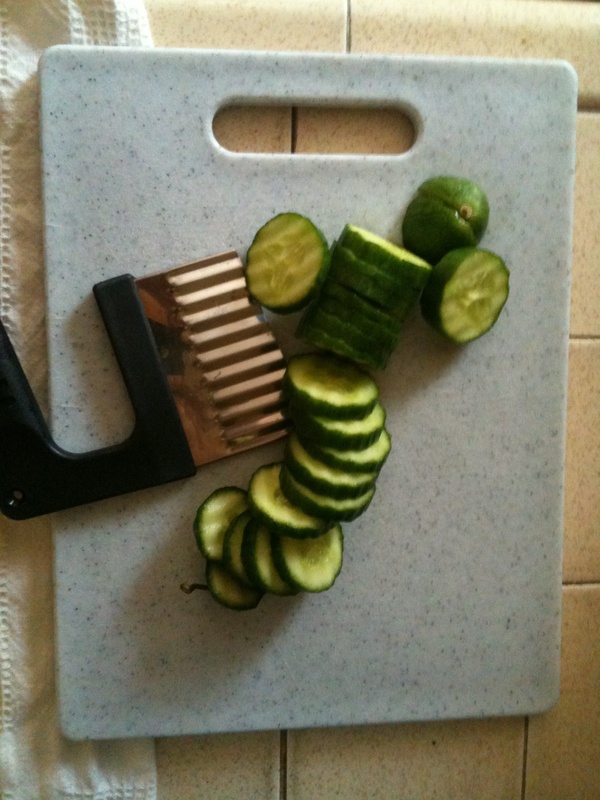 Cut cucumbers into 1/8 inch chips. I like to use a cool cutter like the one shown. But, you can use a regular knife if you can’t find one. 3. Pack jars tightly, fitting as many as you can without breaking any. 4. Fill jars halfway with boiling water. 5. Fill the remaining half with white vinegar almost to the top. Watch out for spillage as you close the jars tightly. Give them a shake to distribute spices. 6. Refrigerate to seal. Enjoy! Wait a week or longer for spicier pickles. This recipe can be adapted for garlic pickle spears. Just omit the hot stuff and sugar and add more garlic and pepper. And cut cucumbers into spears of course. Although I don’t have a garden full of peppers to use up, I can’t wait to make this recipe. But I am even more excited about seeing if we can send our kitchen experiments through the U.S. Mail. Why? 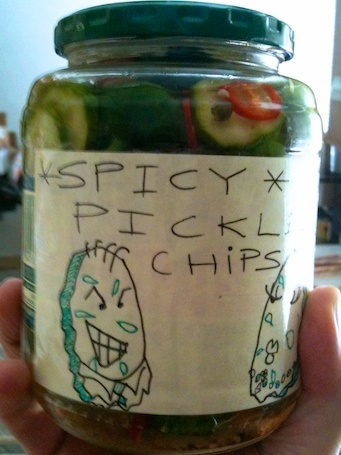 Because I’m sure Marc is a master pickle-maker, and he also creates these awesome labels. Who wouldn’t want one? This entry was posted on August 1, 2011, 11:56 am and is filed under Kitchen Alchemy, Recipe. You can follow any responses to this entry through RSS 2.0. You can leave a response, or trackback from your own site.